Jo McCown Ferguson died peacefully on September 20, 2015, in Ft. Wright, Kentucky. Born in the family home in Central City, Kentucky, he was the son of Dr. Jo Marvin Ferguson and the former Willie Mae Cain, both of Muhlenberg County and both from families who had been in Kentucky since it became a state. After a youth spent in part in Mississippi and on the family farm in Muhlenberg County, he graduated from University High School in Lexington, and received his A.B. and L.L.B degrees from the University of Kentucky, where he was a member of Phi Beta Kappa, Order of the Coif, and on the staff of the Kentucky Law Journal. After briefly practicing law in Central City, he volunteered as a private in the U.S. Army after Pearl Harbor. He rose to the rank of Captain, serving in the European Theatre with both the British and French Armies (Brigadier d' Honneur, 3rd Regiment Anjou) and at the close of the war as a military government officer in Cologne and Munich (he had been trained for military government at Stanford University in California and in Shrivenham and Scotland Yard in England). As Chief of Property Control and Restitution for the Military Government of Bavaria, he seized more than two billion dollars worth of properties which had been taken from the Jewish people and other opponents of the Nazi regime, or which were held by Nazi officials. He appointed more than 6,000 Custodians. After marriage to Gita Hauser, a medical student from Czechoslovakia, in 1947, the young couple returned to Kentucky, where he first became an Assistant Attorney-General in the Highway Department and then was elected Attorney-General of Kentucky. He was Chairman of the Southern Attorneys-General in 1957-58. As Attorney General and as a member of the Executive Committee of the National Association of Attorneys-General, he sought to uphold the United States Constitution. He believed in rural and family loyalties of the South, and sought to uphold the belief in family and traditional ties. In 1960 he accepted appointment from Governor Combs as Commissioner of Economic Security for the purpose of establishing the Medicaid program. Kentucky was the second state to establish such a program. Thereafter he joined the law firm of Grafton, Ferguson, Fleisher and Harper (and successor firms) in Louisville, which specialized in the issuance of municipal bonds. As nationally recognized municipal bond counsel, he prepared and approved the issuance of hundreds of millions of dollars of hospital, industrial, road, park, college, school and other bonds by the state and by local governments all over Kentucky. (His favorite case was related to the bonds for the removal of railroad tracks from downtown Lexington.) He retired in 1990 and has since been active in historical organizations as President of the Kentucky Historical Society and co-founder and first President of the Kentucky Historical Society Foundation. He was a member of the Filson Club, the Society of Colonial Wars, the Pendennis Club, the Louisville Boat Club, the Pyramid Trust and St. Matthews Episcopal Church. 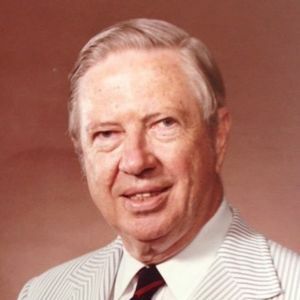 He was an active southern Democrat and was Chairman of the Governor's Commission on Constitutional Revision in 1961 and the Governors Task Force on Finance in 1977. He was a founding Director of Senior House in Louisville. His wife of 65 years, Gita Ferguson, pre-deceased him, as did his sister, Mary Ellen Hunter, and nephew, David Hunter. He is survived by his three daughters, Rita Ferguson Ross of Ft. Thomas and Williamstown, Kentucky (the late Bruce Ross), Diane Ferguson Bell of Louisville (Gregory Bell), and Jo Ferguson Garrison of Raleigh, North Carolina (Robert Garrison); seven grandchildren (Jackie Roche of Huntsville, AL; Margaret Cunningham (Tom) of Ft. Thomas, KY; Nicholas and Alexander Ferguson-Bell, both of Louisville, KY; Cecilia Ferguson-Bell (John) of Chicago, IL; Mack and Anna Garrison, both of Raleigh, NC; four great-grandchildren; and a niece, Molly Alward (Bill), of South Carrollton, a great niece and great nephew. He is survived by one step-brother, C.M. (Bill) Gatton, of Kingsport, TN. Visitation will be held at Pearson's Funeral Home on Breckinridge Lane in Louisville on Thursday from 4-7. The funeral will be on Saturday at 11:00AM at the First United Methodist Church in Central City, followed by a burial at Pine Grove Cemetery in South Carrollton. Visitation will begin at 10:00AM on Saturday at the church. Pearson's of Louisville, and Tucker Funeral Home of Central City, will handle the arrangements. Memorial gifts: Kentucky Historical Society Foundation, P.O. Box 1792, Frankfort, Kentucky 40602-1792. Many fun times and lots of memories growing up on the south Carrollton farm. My dad is Wallace Slinker, David and dad were best of friends and co workers on the farm. Always knew when Jo was coming in to visit and will never forget Jackie and Cecilia coming in. Melissa was always letting me know about there timing and I was always there at some point during the trip to see them. Love this family. Jo was so professional as I always remembered as a child but would still pick on us and make the kids smile and laugh. The Drane family from Richlawn sub. sends condolences. So sorry to hear of your loss. I have so many memories of your dad and mom from when he was Attorney General and you all lived in Frankfort. What a gift they both were. They are together now, watching over the family they loved so much. Impressive service to our country. More importantly a man of honesty and integrity who inspired and loved his family above all else. So enjoyed getting to meet Jo and Gita at Tom and Margies pre wedding reception in Cinti. He told some wonderful stories and had quite a sense of humor. Such a dear older cousin. He certainly lived a long eventful life.